HP swapped Intel for ARM in its Envy x2 for improved performance, but the keyboard cover holds it back. 2-in-1s used to have a bad reputation. Slow performance, bad keyboards, and flimsy cases. 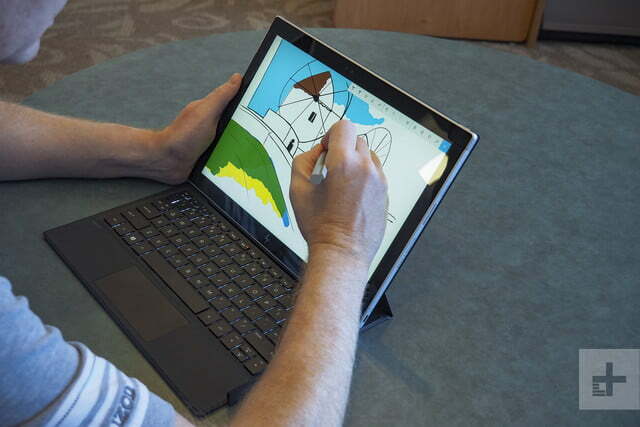 Thanks to devices like the Surface Pro, today’s 2-in-1s have erased that stigma. 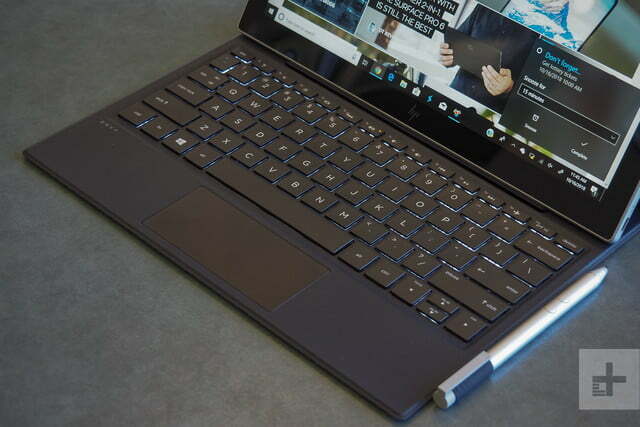 The HP Envy x2 is the latest 2-in-1 looking to capitalize on that new reputation. It came first with a Qualcomm processor, but we got a chance to put the new Intel version through its paces. Our configuration came equipped with a 7th-gen Intel Core i5-7Y54 CPU, 4GB of RAM, and a 128GB SATA solid-state drive (SSD). 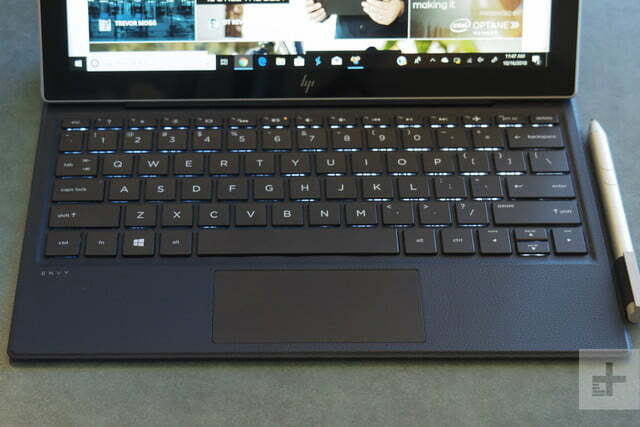 The Envy x2 is priced at $1,150, although as we write this review, it’s on sale for $900 including the keyboard cover and HP active pen. Incorporating an Intel CPU indeed promises better performance than the Qualcomm version provides, to go along with the battery life afforded by the low-power Core i5 variant and the integrated Intel LTE radio. 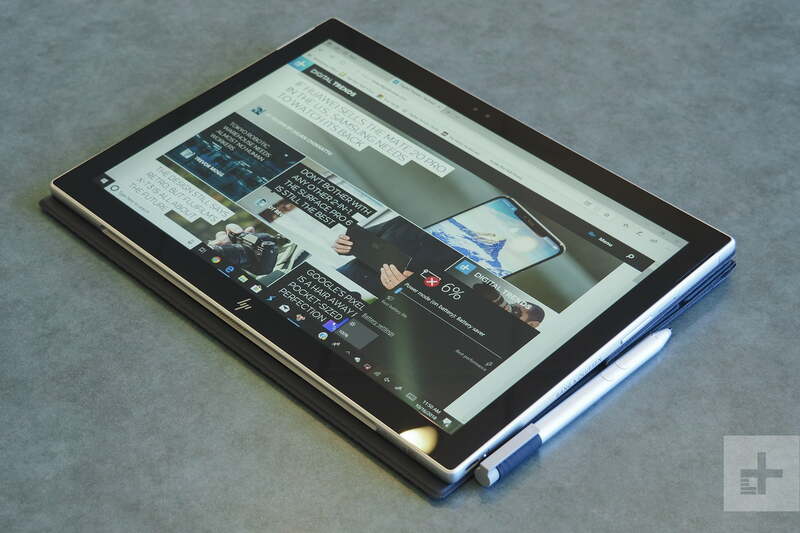 Does the transition to Intel make the HP Envy x2 a more competitive detachable tablet? 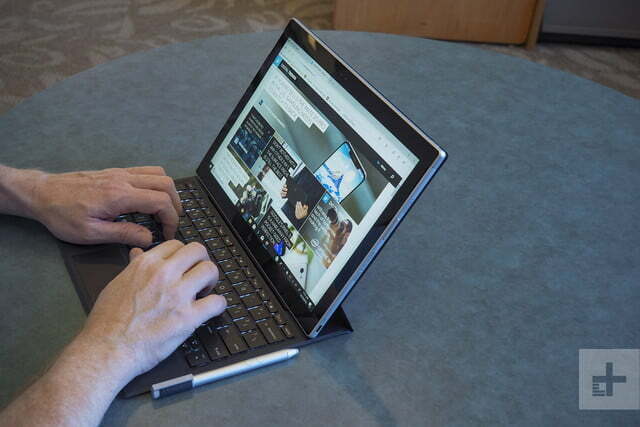 The Envy x2 is a lot like many other detachable tablet 2-in-1s on the market today. It’s all-metal, enjoys a solid build quality without flexing or creaking, and has larger bezels around the edges ostensibly to make it easy to hold as a tablet. The Microsoft Surface Pro 6, Acer Switch 7 Black Edition, Lenovo ThinkPad x1 Tablet, and more fit the same basic mold – and it’s a good one. 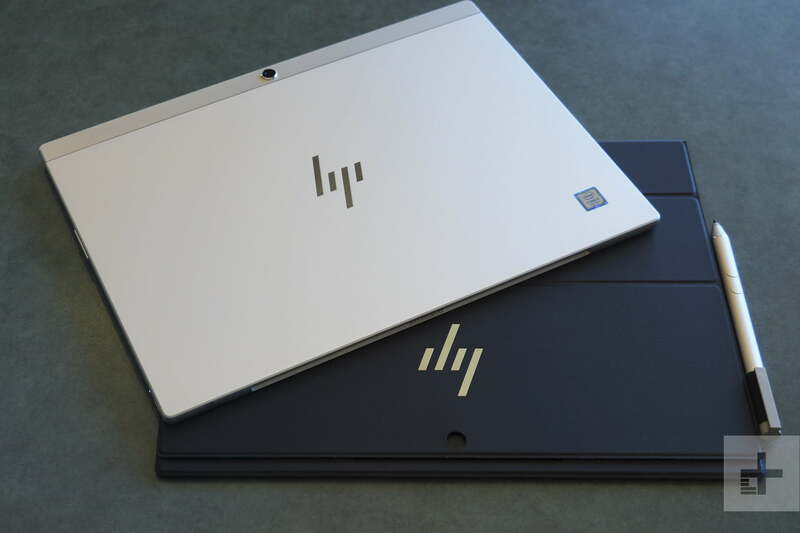 The aesthetic is also pleasant, with an all-silver chassis and reflective HP logo on the back that contrasts against the black bezels on the front — again, typical, with rounded edges and a slightly darker strip of plastic along the top of the rear panel. The edges are chamfered, and there’s a thin line of chrome separating the metal and plastic portions. The Envy x2 is an attractive tablet but it’s not a looker like HP’s own all-black Spectre x2, and it’s not as modern as the Surface Pro. 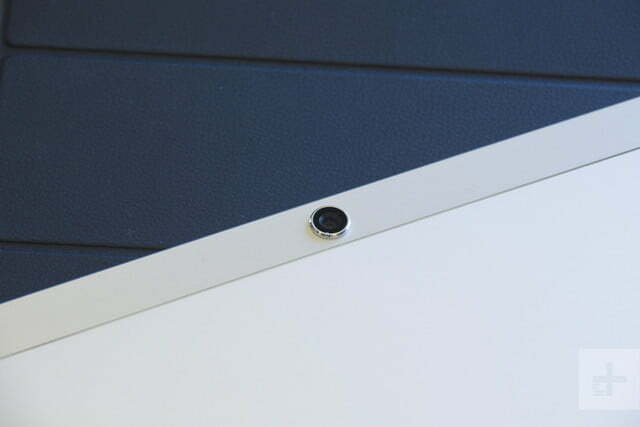 One thing that makes the Envy x2 stand out among the crowd of detachable tablets is one thing that’s missing. 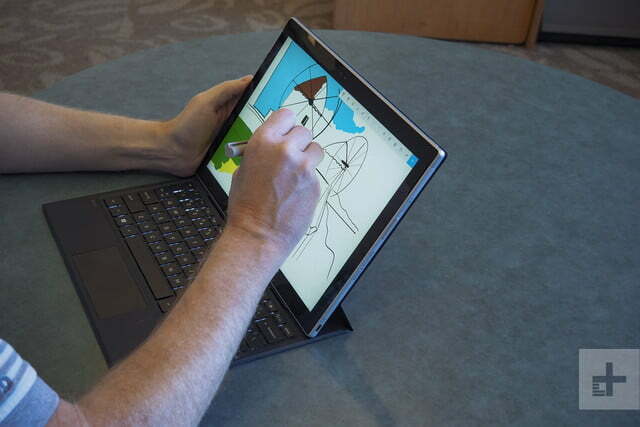 The tablet has no kickstand, meaning that it’s more like the iPad Pro than the Surface Pro and it relies on a keyboard or cover if you’re going to use it propped up on your lap or a desk. Normally, that’s not a terrible thing as long as there’s a good keyboard or cover available. You’ll find yourself twisting the Envy x2’s keyboard cover into unintended angles just to be able to use it in your lap. 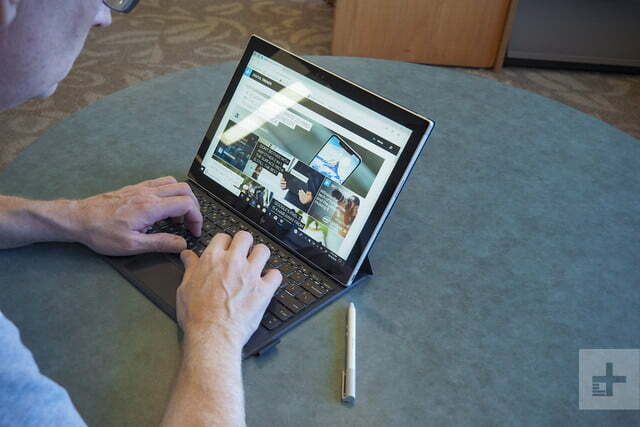 The Envy x2’s detachable keyboard, unfortunately, doesn’t qualify as “good.” And it’s strange because the keyboard that ships with the ARM version is very well-designed, snapping onto the tablet and providing a Surface Pro-like kickstand with a full range of motion. The Intel version, on the other hand, also snaps onto the tablet via a magnetic connection, but it only provides three angles for the tablet – and the most upright isn’t upright enough. Worse yet, the keyboard cover doesn’t provide a very stable base for the Envy x2 in that same uncomfortable upright angle. Using it on a lap simply doesn’t evoke confidence, and you’ll find yourself twisting the cover into unintended angles to make it work. Pretty much every other keyboard cover or base is much better, and that includes the ones for HP’s Spectre x2, HP Chromebook x2, and Samsung Galaxy Book 2. That’s a real shame, because otherwise the Envy x2 itself is plenty comfortable to use. It’s just 0.31 inches thick, meaning it’s slightly thinner than the Surface Pro 6’s 0.33 inches, and it’s light at 1.72 pounds compared to the Surface Pro at 1.70 pounds. When you’re using the Envy x2 as a pure tablet, it feels great in hand. 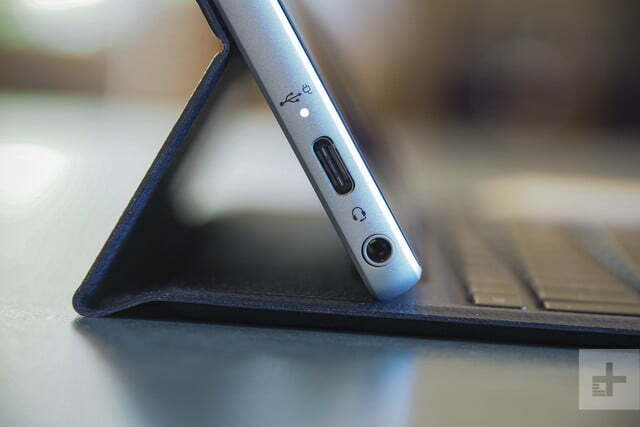 Connectivity is comprised primarily of the increasingly common USB-C port (without Thunderbolt 3, sadly), of which the Envy x2 has one on each side. The ports support data, display, and power. There’s also a microSD card slot, a SIM slot for always-connected LTE data, and a 3.5mm audio jack. Wireless connectivity is the usual 2×2 MU-MIMO 802.11ac Wi-Fi and Bluetooth 4.2. Our review unit came with an LTE card, but we ran into some issues and couldn’t test the cellular connection (we will update this review if we get those issues resolved). The LTE SIM slot is an important feature that makes the Intel-based Envy x2 competitive with the Qualcomm version. We’ve already talked about the keyboard cover’s design, and so we won’t go into it again here. Besides the poor angles and stability, though, the backlit keyboard itself provides a snappy mechanism and plenty of travel to make for a precise typing feel. There’s no way to prop the keyboard up at an angle, though, meaning you’re limited to typing on a very flat surface. The Envy x2 is fine for making quick notes and simple drawings, but artists will want to look elsewhere. 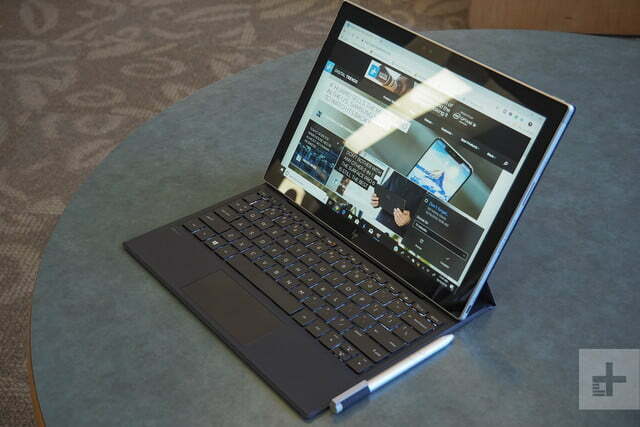 The touchpad is a bit short and wide, much like the one on the Surface Pro 6’s Type Cover. It’s something we’ve noticed in most detachable keyboard covers, but this one isn’t even a Microsoft Precision version. Therefore, multitouch gestures aren’t quite as precise as on most other covers that support this superior touchpad protocol. The touch display is plenty precise, though, which enhances the tablet experience. Finally, the included HP Active Pen supports Windows 10 Inking but falls a bit behind the Surface Pen and S Pen included with the Galaxy Book 2. The HP version only offers 1,024 levels of pressure sensitivity compared to the 4,096 levels that those two pens support, meaning HP’s Active Pen isn’t as responsive as today’s best options. It’s fine for making quick notes on documents and simple drawings, but artists will want to look elsewhere. Windows 10 Hello support is provided by an infrared camera, and it works well. Just turn on or wake up the Envy x2, look at the display, and you’ll be logged in without any muss or fuss. The Envy x2 features a 12.3-inch IPS display that runs at a relatively low resolution for tablets today. Specifically, it’s a 1,920 x 1,280 (188 PPI) panel that’s far less sharp than the Surface Pro’s 2,736 x 1,824 (267 PPI) or the HP Spectre x2’s 3,000 x 2,000 (293 PPI). It’s in the productivity- and tablet-friendly 3:2 aspect ratio, though, which is a plus. When we subjected the display to our colorimeter, we found it to be a very good display that competes well with the excellent panels on the Surface line. 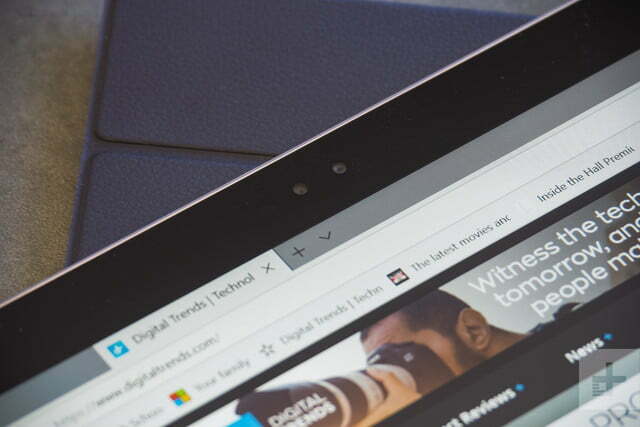 To begin with, it was just as bright as both the Surface Pro 6 and the Surface Go, exceeding 400 nits, and it matched those two with an average color gamut (73 percent of AdobeRGB) that’s great for productivity work if not for professional photo editors. Contrast was a little low compared to most of our comparison group at 880:1 at 100 percent brightness, but that’s nevertheless a good score that’s slightly above average for most notebooks today. As usual, Microsoft’s Surface line excels in this metric. The Envy x2’s color accuracy was also average for this group at a delta of 2.09, which is just okay. During our testing, we found the display to be very good for getting our work done and also for watching the occasional video. Things were just a little bright thanks to a gamma of 2.1 (2.2 is perfect), but we enjoyed taking an occasional Netflix break. The Envy x2’s display was therefore a positive experience with only its relatively low resolution holding it back. Audio was good, thanks to front-firing speakers and Bang & Olufsen tuning. Volume was enough for a medium-sized room, with pleasant mids and highs and the typically poor notebook bass. Distortion was minimal at maximum volume, and we found it more than good enough for Netflix and YouTube videos. You’ll want external speakers or headphones to truly enjoy your tunes, but that’s fairly typical for today’s tablets. There’s a 7th-gen, low-power Intel Core i5-7Y54 CPU inside, and that’s the most significant change from the ARM-based version. This very efficient processor promises good (but not ARM-good) efficiency and usually fast enough performance for the typical Windows 10 productivity tasks. It’s also a generation behind, with the newest 8th-gen low-powered Intel CPUs offering even better performance and efficiency. That pretty much perfectly defines our experience during our testing. In the Geekbench 4 synthetic benchmark, the Envy x2 scored 3,568 in the single-core and 6,665 in the multi-core tests. That’s more than twice as fast as the Qualcomm 845-based Asus NovaGo, and it’s also faster than the Pentium processor in the Microsoft Surface Go. But it’s about half as fast as the 8th-gen Intel Core i5 in the Surface Pro 6. The similar Core i5-7Y57 in the Lenovo ThinkPad x1 Tablet was just slightly faster. Interestingly, the Qualcomm 850 in the Samsung Galaxy Book 2 is far more competitive with Intel’s low-power alternative. That 2-in-1 was slower in the single-core Geekbench 4 test, but it was faster in the multi-core benchmark. 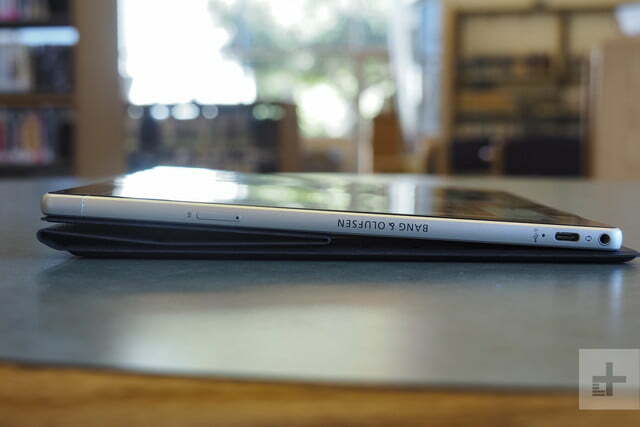 During our testing, we found the Galaxy Book 2 to be slower than the Envy x2 in real-world use, but not nearly as slow as those using the older and slower ARM processor. Turning to our more real-world oriented Handbrake test that encodes a video to H.265, the Envy x2 demonstrated that it’s not really intended for more demanding tasks. 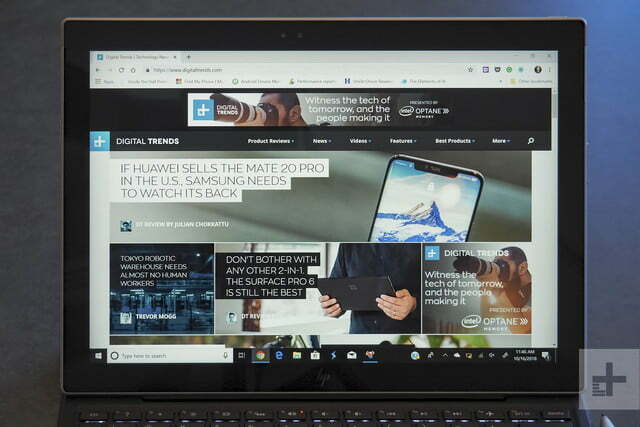 It took about ten and a half minutes to complete the test, which is almost twice as long as the Acer Switch 7 Black Edition with its Core i7-8550U and about 200 seconds slower than the Surface Pro 6. Generally speaking, we found the Envy x2 to perform well enough for the usual web browsing, Office, and media consumption tasks that tablets are usually asked to do. Our real complaint isn’t with the tablet’s CPU, though, but rather with HP’s decision to equip it with only 4GB of RAM. That’s enough for basic Windows 10 work, but open too many apps and browser tabs and things start to slow down. HP equipped the Envy x2 with a Samsung SATA SSD that proved quite a bit slower than the PCIe SSDs in our comparison machines. The Surface Go’s SSD was faster in reading data but much slower in writing data. Overall, we didn’t notice any storage-based slowdowns with the Envy x2, and you’ll find its SSD more than fast enough for the less demanding productivity tasks you’re likely to be performing on this tablet. The Envy x2 suffers greatly in the gaming department thanks to the Intel HD 615 integrated graphics built into the low-power CPU. Simply put, there’s no reason to believe the tablet will be powerful enough for anything but casual games. We went ahead and ran some tests on the Envy x2 to confirm our suspicions. In the 3DMark Fire Strike benchmark, the integrated graphics managed a paltry score of 645. That’s a little faster than the ARM-based NovaGo and a little slower than the Intel UHD 615 GPU in the Surface Go. Of course, it’s significantly slower than any 2-in-1 with anything more than the slowest integrated graphics. We also tried out Rocket League on the tablet, and that is usually playable even on Intel’s slower GPUs. Not so much with the Envy x2, however, as we couldn’t hit our minimum of 30 frames per second (FPS) on the lower performance setting at 1080p. In short, don’t buy this tablet if gaming is at all important to you. You can play Solitaire or Minecraft, but don’t plan on tackling anything more demanding. The low-power CPU in the Envy x2 might not provide better than typical productivity performance, but it does tend to excel at its primary design purpose: Efficiency. It’s not quite as efficient as the ARM Snapdragon 835 in the Asus NovaGo, but it’s generally more efficient that the typical Intel processor you’ll find in modern tablets. The Envy x2 bears out that expectation thanks to its 49 watt-hour battery capacity. In our most aggressive battery test, the Basemark web browsing benchmark, HP’s tablet lasted for a strong five hours. That’s significantly better than the Surface Go and the 2017 Surface Pro, and it beats out the Surface Pro 6. 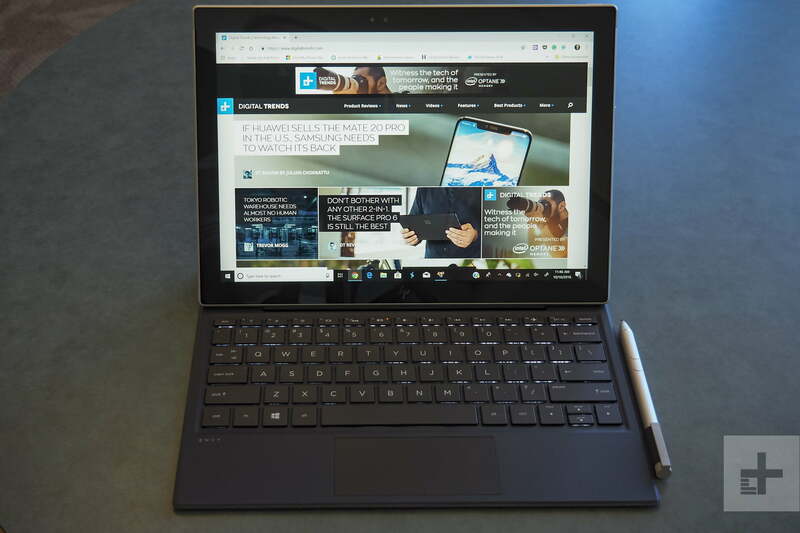 Note that the NovaGo lasted for twice as long in this test, but of course it ran the benchmark much more slowly, while the Galaxy Book 2 lasted “just” around 50 percent longer. In the end, the HP Envy x2 is a weird bird. For web browsing, the Envy x2 was also a strong competitor, lasting for almost nine and a half hours. 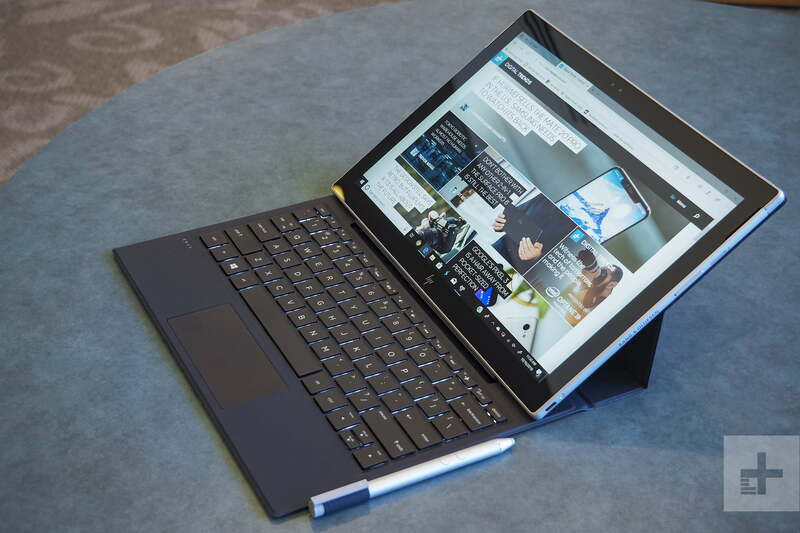 It couldn’t keep up with the NovaGo, but it enjoyed almost twice the longevity as the Surface Go and greater than three more hours than the 2017 Surface Pro. Finally, the Envy x2 looped our Avengers test trailer for 11 hours, a very strong score that beat out the Surface Go and 2017 Surface Pro. 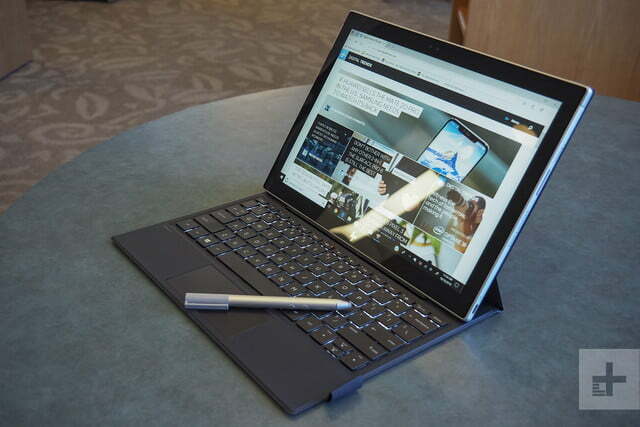 The 8th-gen Intel CPU in the Surface Pro 6 was much stronger, though, and the NovaGo and Galaxy Book 2 were both very good in this test. Overall, the HP was a strong performer away from a plug, particularly compared to its competitors for productivity tasks. It’s very likely to keep you running for a full workday, as long as you’re not pushing the CPU for demanding tasks like video encoding — which you’re unlikely to do thanks to the relatively low performance. In the end, the HP Envy x2 is a weird bird. It’s slightly thicker and heavier than its ARM-based sibling, and it doesn’t last nearly as long on a charge, but it performs much better and promises the same kind of always-connected internet access. It enjoys a solid and attractive build quality, but its keyboard cover doesn’t share in its mostly positive design. In the end, there’s not enough oomph to justify it’s relatively premium $1,150 retail price. 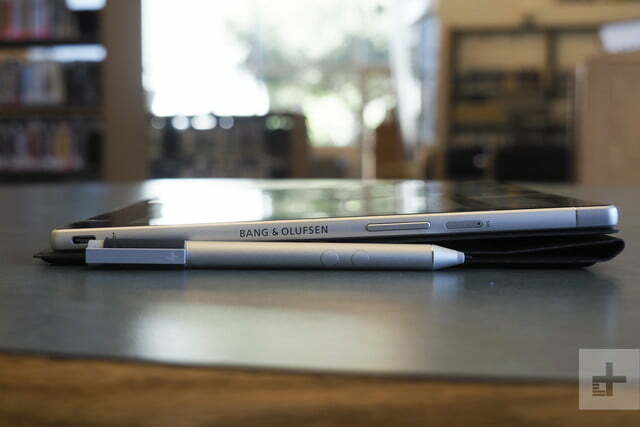 It’s more attractive on sale at $900, particularly given that it includes the keyboard cover and active pen. 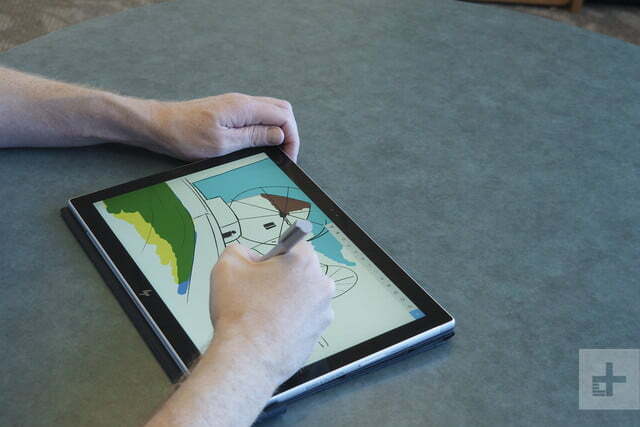 The obvious comparison is the Surface Pro, which is another Intel-based detachable tablet. Microsoft’s tablet starts at $900 for a Core i5 CPU, 8GB of RAM, and a 128GB SSD, but its best Type Cover adds $160 to the price, and the optional Surface Pen is $100 extra. 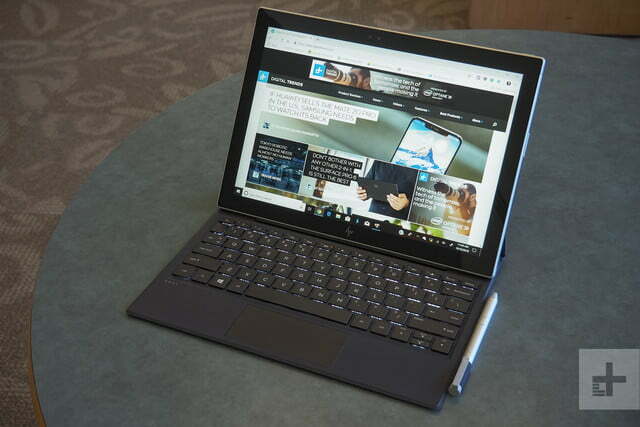 That makes the Surface Pro considerably more expensive than the Envy x2 on sale, but you’ll find Microsoft’s tablet to be faster with better battery life and a vastly more useful laptop form factor. We should also compare the Envy x2 to ARM competitors such as the Asus NovaGo and the Samsung Galaxy Book 2. That’s reasonable given that this version of HPs detachable tablet is meant to leverage Intel’s faster CPUs. When compared to the NovaGo with its Snapdragon 845, the Envy x2 was much faster and therefore a better choice in spite of its lesser battery life. Against the Snapdragon 850-based Galaxy Book 2, however, the Envy x2 isn’t so much faster that you can safely ignore the extra battery life. The Samsung is priced around $1,000, meaning it’s a strong competitor against HP’s 2-in-1. The Envy x2 is built well enough that it promises to last as long as its competitors. 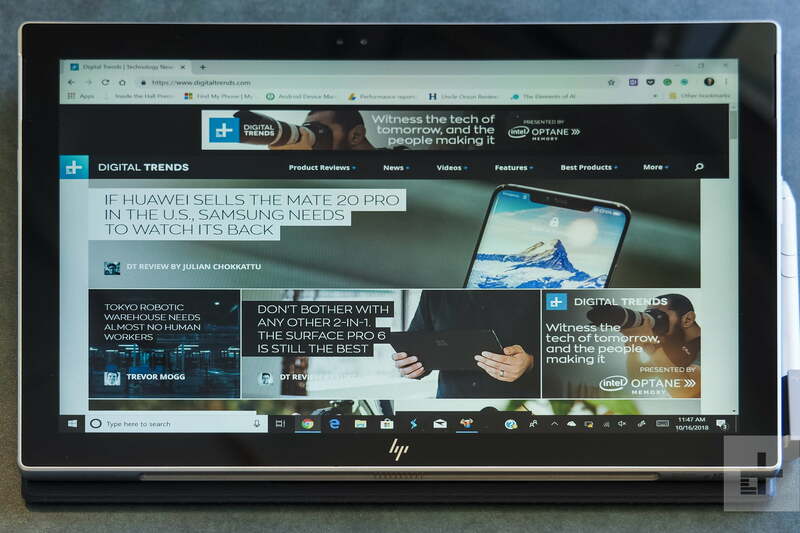 Its CPU is fast enough to keep up with Windows 10, but its storage space is relatively small and its RAM isn’t going to help advance the tablet’s potential uses. There’s an industry-standard one-year warranty to keep you covered, but this isn’t the longest-lasting tablet around. No. We simply can’t recommend the poorly design keyboard cover for anyone who wants to use their tablet as a laptop. The battery life is good but not enough to counter this glaring flaw. And even on sale, it’s not priced to move compared to some superior options.